Steel is rising for Kaleida Health’s new John R. Oishei Children’s Hospital and University at Buffalo’s new School of Medicine and Biomedical Sciences, on the Buffalo Niagara Medical Campus. The concrete foundation of the 12-story, $270 million hospital has been poured, and a giant red tower crane will be operating through the end of the year, as workers for Turner Construction Co. and its subcontractors erect more than 4,500 tons of steel for the frame of the 460,000-square-foot building. Workers last week began using a 240-foot “crawler” crane to put up steel for the first three floors of the $375 million medical school, a 628,000-square-foot, eight-story building consisting of two L-shaped structures paired together. A tower crane will go up this summer. 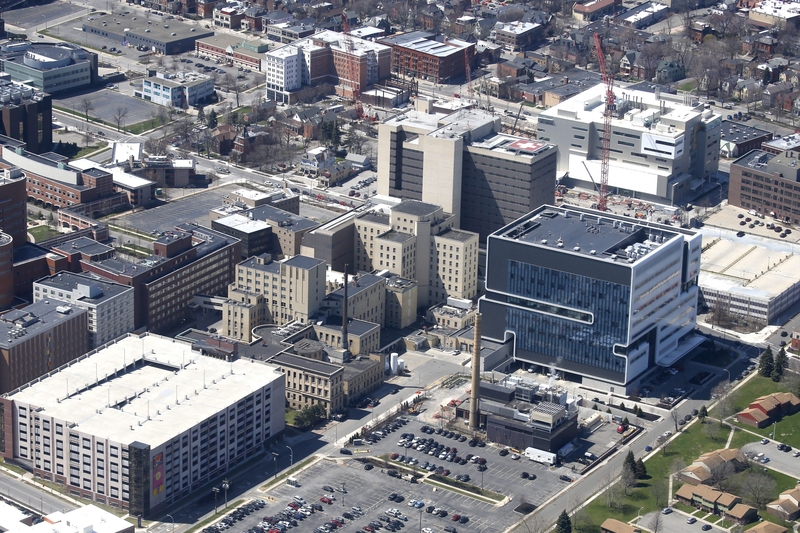 The two projects are going up next to the Conventus building, where Albany Molecular Research Inc. now occupies the seventh floor. The indoor parking also is now open, but the rest of the building’s tenants have not yet moved in. On the other side of the Medical Campus, Roswell Park Cancer Institute, right, is nearing completion of the shell and core of its jagged-edged, glass-curtain Clinical Sciences Center, which features a zig-zag facade and red accents provided by terra cotta panels and sunshades. Work on the building’s interior is well underway, with the building targeted for completion next year.